It’s times like these when comfort food is a must. This dish really hit the spot! If you love cheese, this is definitely for you. And if you love and quick and easy meal, even better! Stay warm, everyone! Cook gnocchi according to package directions. Add peas when there is 1-2 minutes of cooking time left. Heat heavy cream, gorgonzola and mascarpone together in a small pot over medium high heat, stirring frequently. Lower heat once it starts simmering and keep cooking until it thickens. Drain gnocchi and add to pot with sauce. Add Pecorino Romano, pepper and crushed red pepper. Stir until combined. Divide into 4 bowls and top with a little more cheese and pepper, if desired. 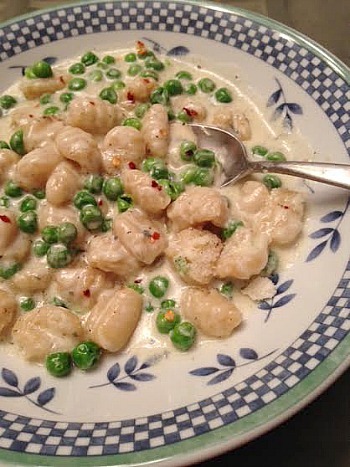 This entry was posted in gorgonzola, main dishes, mascarpone, pasta, peas, QuickAndEasy. Bookmark the permalink.